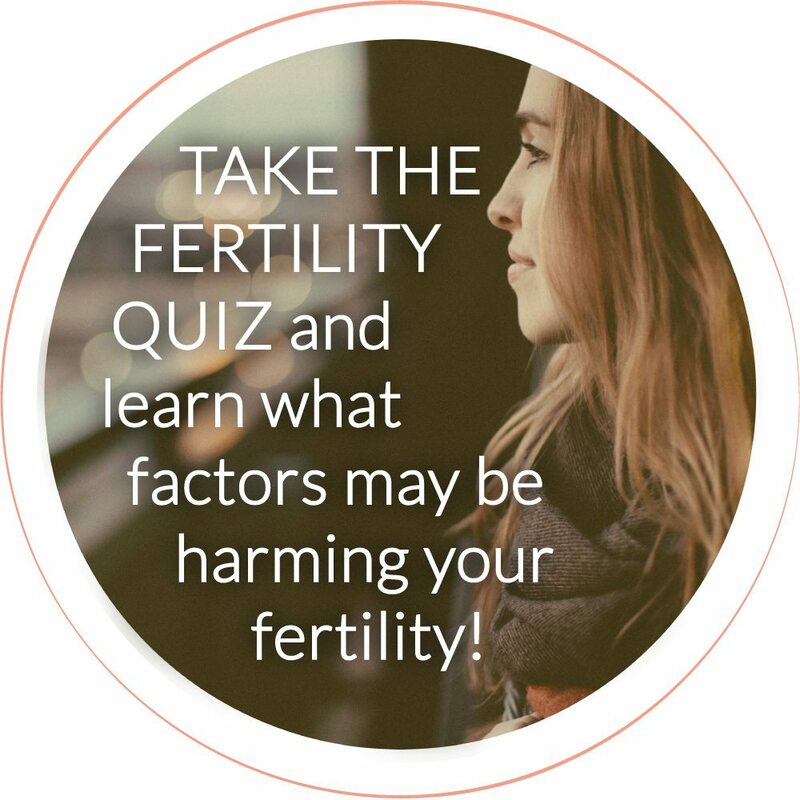 If you’ve been a long-time follower of my blog, you know that a huge component of optimizing your fertility is steering clear of hormone-disrupting chemicals (and if you’re new to my blog, welcome! Check out this page to learn a little more about me). These chemicals, also known as endocrine disruptors, are found in just about EVERYTHING, including your water, your food, your clothing, your furniture, your car, and the places of business you frequent. And unfortunately, some of the WORST offenders are probably in your kitchen and bathroom cabinets right now—I’m talking about cleaning products. In the last century, human-made chemicals involved in mass-production of all kinds of cleaning products have been introduced to our homes and our environment. While originally intended to kill harmful bacteria and make cleaning easier, exposure to poisons found in cleaning products (like bleach and ammonia) can cause burning of the eyes, nose, throat and respiratory tract, and can result in blindness. Inhalation of of the fumes from cleaning products can cause coughing, nose throat irritation and lung damage. Other ingredients like surfactants and synthetic fragrances are not dangerous in the short term, but in the long term interfere with our body’s natural processes, disrupting our hormones, affecting fertility, cause cancer. Decades of studies indicate that serious health issues are on the rise and are due in some part to our ongoing exposure to toxic chemicals. One of the most worrisome kinds of chemicals found in cleaning products are known as xenoestrogens. Xeno means “foreign”—xenoestrogens are chemicals that mimic estrogen in your body, throwing your endocrine system totally off balance. They disrupt the natural processes of your body’s endocrine system, wreaking havoc on proper hormone balance. Your endocrine system works like a complex communications network. The glands in your body release different hormones that act as messengers telling various parts of your body what to do and when to do it. 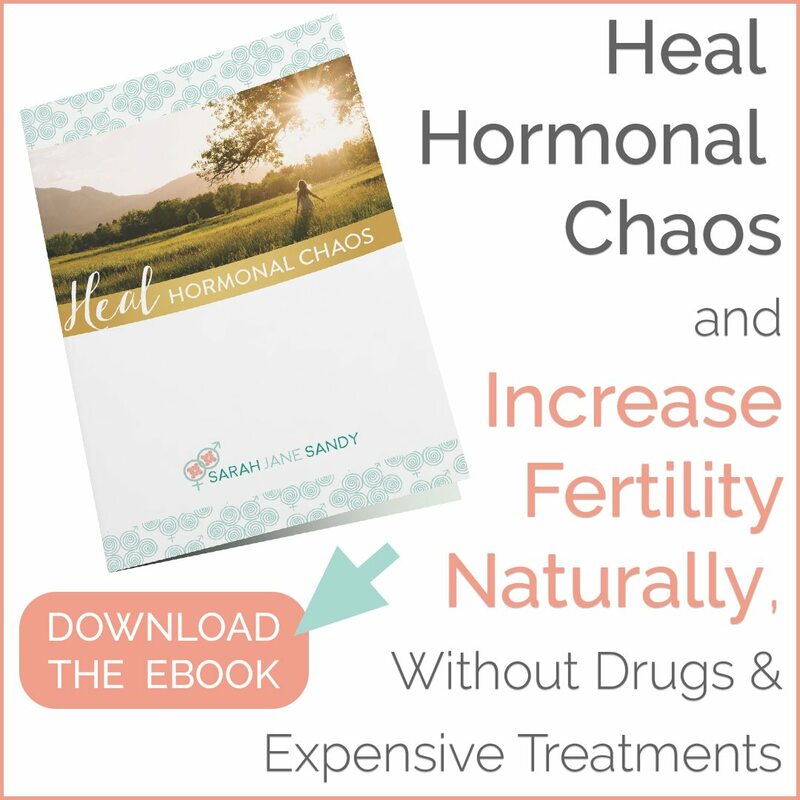 When foreign chemicals that mimic your natural hormones enter your body, they confuse the network, sending the wrong signals to the glands in your body and blocking hormone receptors. Xenoestrogens mimic natural estrogen, a hormone that, among other things, regulates reproductive process in women AND men. Synthetic estrogen is not biodegradable, so it stays stored in the body’s fat cells. Over time, estrogen builds up in the body, resulting in a condition called estrogen dominance. Symptoms of estrogen dominance include things like hair loss, depression, anxiety. mood swings, irritability, insomnia, PMS, breast tenderness, and endometriosis. Too much estrogen can also contribute to infertility and early miscarriage in women, and prostate and testicular cancer in men. So you know you need to reduce your exposure to the toxic chemicals in cleaning products, but how? 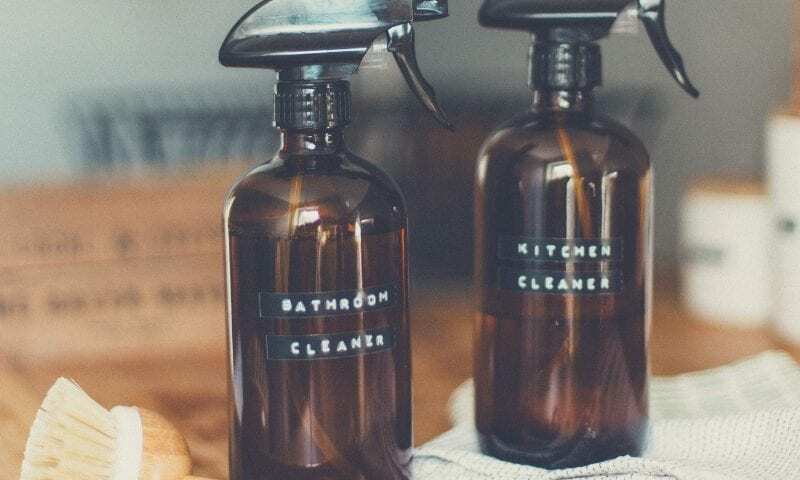 Well despite marketing campaigns that show cartoon bubbles scrubbing the shower for you, the truth is that it’s easy and convenient to find household cleaners that are non-toxic, and it’s also simple and cheap to make your own. Whether you use homemade or buy pre-made, non-toxic cleaners are MORE than adequate to keep your home clean and safe. Non-antibacterial soap and water kills most household germs, and plain old vinegar is a powerful disinfectant. Unless you or someone in your family is immunocompromised, or you’ll be in an area where you’re exposed to dangerous pathogens, there’s literally NO good reason to use bleach, ammonia, or other toxic, poisonous chemicals. If you’re new to non-toxic cleaning, let’s go over the basics. First of all, if you simply want to go out and buy your cleaning products, I recommend Biokleen, which you can find on my Shop My Home page. They’re affordable and work really well to clean everything from your counters and floors to your toilet and showers, and they also make dishwasher and laundry detergents that are safe, non-toxic, and biodegradable. Interested in making your own products? Just remember to use caution—natural doesn’t always mean safe. Homemade cleaning products can still irritate eyes and skin, and be harmful if swallowed. All homemade cleaning products should be kept away from small children, and that includes essential oils. You’ll find that many online DIY cleaning recipes call for Borax. While it has been considered to be a mild irritant in the past (similar to salt and baking soda), recent research indicates that sodium borate and its derivatives have the potential to harm the reproductive system. For this reason, I don’t advise using Borax in any of your homemade cleaning recipes. Glass Cleaning Bottles for storage—always avoid plastic when you can. White Vinegar helps dissolve dirt, grease, and removes odors, stains and soap scum. It’s a fantastic streak-free cleaner for mirrors and windows as well. You’ll want to dilute with equal parts water, and also check out some additional recipes below. Baking soda works as a mildly abrasive cleaner and natural deodorizer. You can mix baking soda with liquid soap to make a paste and use as a scrub for your shower and bath, or sprinkle dry baking soda on carpets, let sit, and then vacuum up to deodorize. Salt can be used to scour cast iron, and can be used along with baking soda to make a scrub more abrasive. Lemons work as a deodorizer, grease cutter, and as a mild bleach when exposed to sunlight. Dip half a lemon in sea salt and scrub your cutting boards to clean and deodorize them. Castile Soap, in liquid form or in bars, can be used to clean just about anything. Check out some of the recipes below for ideas. 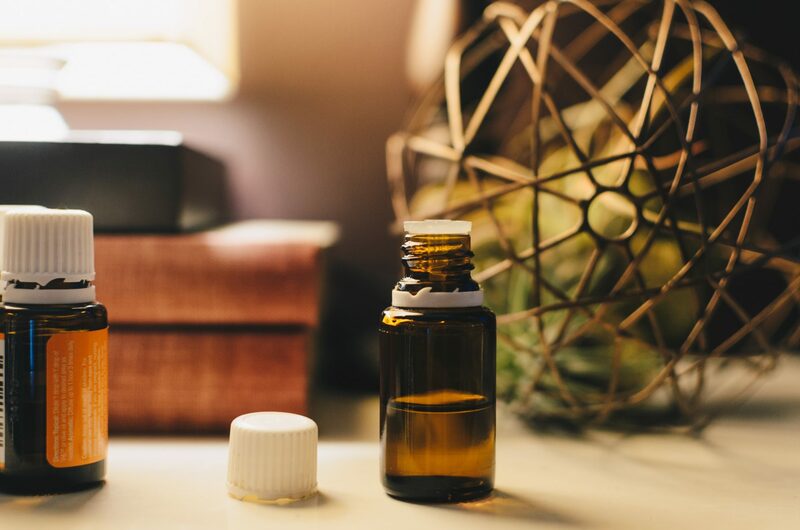 Essential oils can be mixed with water and used as air fresheners, either in a spray bottle or in a diffuser. They can also be used to add scents to any of the other cleaning products you create. Vodka is a potent odor and stain remover, and can be used as a disinfectant. Cellulose Sponges are naturally more absorbent that most household sponges, which are usually made of polyester or plastic, and may be treated with triclosan, a chemical that can produce chloroform (a suspected carcinogen) when it interacts with the chlorine found in tap water. Reusable, washable, biodegradable cleaning cloths hold up better than paper towels, are free of bleach and dye, and save money in the long-term. Floor cleaner: 2 Tbsp liquid Castile soap, 1⁄4 cup white vinegar, 1 gallon of water, 10 drops of your favorite essential oil. Drain Cleaner: pour ¼-½ cup baking soda down the drain, then add ½ cup vinegar and plug the drain. After 15 minutes, pour in boiling water. (Only use this method with metal plumbing, and do not use this method after using a commercial drain opener– vinegar can react with other chemicals to create dangerous fumes). Oven Cleaner: spray interior of oven with water. Mix ¾ cup baking soda, ¼ cup salt and water to make a thick paste, and over oven interior. Let sit overnight. Remove paste and grime with spatula and steel wool, wipe clean with a wet sponge. Toilet Bowl Cleaner: Pour ½ cup baking soda and 1 cup vinegar into the toilet and let it set for a few minutes. Scrub with brush and rinse. Dryer Sheets: fill a spray bottle with vinegar and 20-30 drops of your favorite essential oil (if you want unscented, plain vinegar works too). Lightly spray scraps of clean cotton cloth until just damp, and store in a glass jar. Toss one into the dryer to reduce static. Carpet & Upholstery Stain Remover: dampen a clean, absorbent cloth with vodka and gently blot the stain, avoid rubbing. Leave the cloth over the stain for a few minutes. Allow to air dry, and repeat as needed until stain is removed. Dishwashing Detergent: mix 1 cup baking soda with about ¼ cup of grated, unscented bar Castile soap. Use this mixture to fill soap the compartment. Use undiluted vinegar in the rinse compartment. Note: this will not dissolve tough, baked on grime, so make sure to rinse dishes beforehand, or purchase a non-toxic commercial detergent if you want something tougher. Laundry detergent: grate or shred 1 bar of Castile soap into 3 cups of baking soda. Add 10-20 drop of essential oil (if desired) and mix. Use 1 Tbsp for regular loads, up to 3 for heavily soiled loads. Use undiluted vinegar in the rinse cycle. Air out your home: toxins, irritants and pollutants can become trapped in modern air-tight homes. Especially in summer and winter when you may keep you home closed up more often, make sure to open up windows and doors for at least 3-5 minutes a day to let in fresh air. Keep your furry kids clean: while it’s not healthy to give animals frequent baths (it drys out their skin), brushing your critters often and gently wiping their feet after walks will also minimize dander, dust, and other toxins from collecting inside your home. Take off your shoes! The easiest way to keep pollutants and chemicals out of your house, as well as keep your floors cleaner, is to take your shoes off as soon as you come inside. Keep house slippers by the front door for yourself and for guests. You’ll be amazed at how much cleaner your floors will be! Commercial cleaning products contain toxic chemicals and endocrine disruptors, and should be avoided . There are plenty of safe and effective non-toxic alternatives on the market . What are your favorite non-toxic DIY ways to clean? What non-toxic products have you tried and loved? Spread some CLEAN lovin’! I bet you have some friends who would love to read this too :). Looking to have a more in-depth conversation about switching over to natural cleaning and non-toxic products? Schedule a consultation with me!